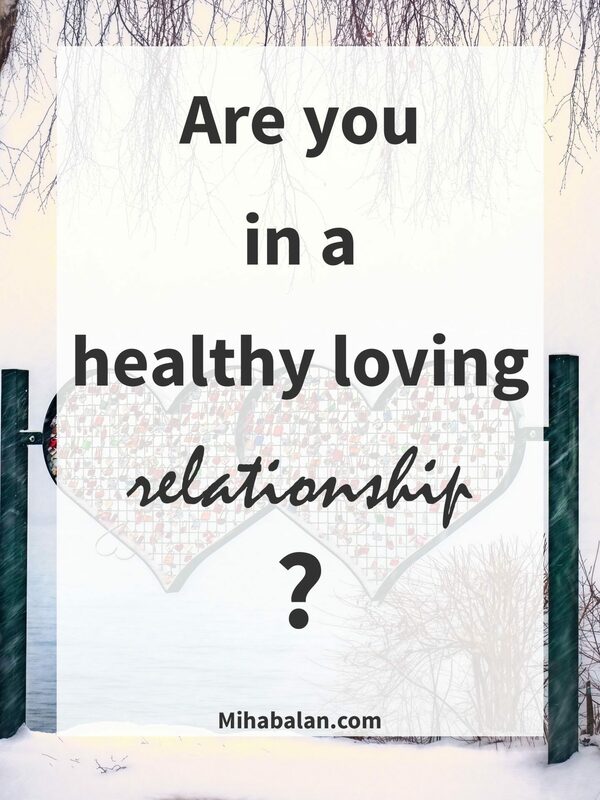 Are you in a healthy loving relationship? Is your relationship as stable as you think? Have you ever wondered if your relationship is on the right path or if it’s unhealthy for you? Let’s see. 6 years ago, if someone had told me I would be in a long term relationship and about to get married, I would have laughed because the word ‘’relationship’’ seemed like a really big deal to me at that time and it’s still is. Being in a long term relationship is hard work, right? I was always thinking that only grown up people can have a relationship, so am I all grown up now? Well, I’ll better be as I am soon 31 haha. If you have been in a relationship for an extended period, I guess you are with me when I say that there is no such thing as the perfect relationship. Even in the best ones, there will be discussions and disagreements and if the relationship is strong enough it will last through those problematic times, but sometimes it’s not enough and relationships end. The idea to write about this topic came to me a while ago. I saw how much you guys liked another of my articles titled how often is normal where the topic is also about relationships. I was watching a tv show a while ago, where a Romanian life coach was being interviewed on how you define a healthy relationship. She mentioned that sometimes women feel trapped in a relationship with a man because it’s hard to give up and start all over again. To move and not have the support you used to have, especially if you become a single mom. We all say “I love you” so easily but a relationship needs more than that. Love can be shown in so many ways and it does not mean you have to stay in a unhealthy relationship just because you’ve been together for a long time. So what is a healthy relationship? And how do you know you are in one? When I think of healthy, I immediately think of food or lifestyle: eating healthy, meditating, exercising and so on. But healthy in this case, is more than just physical well being. It’s what allows you to be the best version of yourself and hopefully also sets your soul on fire at the same time. Many couples build their relationship by finding lots of things they have in common which is great. You get to spend more time with the loved one, have fun and enjoy it, but some couples also try hard to have too much in common. I even know people in relationships that think that they must have the same interests and opinions about everything otherwise their relationship is not good enough. That puts a lot of pressure on them to change who they are and on the relationship. Some people, like me my fiance for example, we don’t have much in common at all to be honest but we are happy together. I come from an East European country, he is from Denmark. Our customs, food, style, music, hobbies, language and even our ways of thinking are different. It’s not easy but we made it work through lots and lots of talking (fights haha) and understanding. How can you define a healthy relationship? All good points, and from my own experience I would also add that being able to be yourself with the person you are in a relationship with, and helping each other is the definition of a healthy relationship. To make a comparison with how I used to be with other partners or the times when I was single, a healthy relationship changed my life and made me grow up on me a lot – in a good way. I think that being or finding a person that you can build a healthy relationship with it is so important for our well being. lifeoptimizer.org say “relationships fulfils your most important need of all”. Why is having a healthy relationship so important to me? Having stability at home lowers your stress level. It’s a part of your life that you don’t need to worry about, and even better – your significant other offers you comfort and support. Being able to create a healthy relationship at home will teach you how to create other healthy relationships around you with your friends, family and neighbours. For me, when I think of the word relationship, I think of something long term. It means commitment, patience and maturity. I can say with confidence that my relationship has changed me a lot, I notice it in the way I think now. The decisions that I take now compared to how I use to think and how impulsive I was. I had long relationships before but they were always centered around drama and conflict, always something going on both on his and my side. After years together, a relationship changes, but in the best ones the butterflies in your stomach are still there. Five years later and sometimes I still feel butterflies in my stomach when I see him at the door. Being in a healthy relationship means you are with someone that loves you just the way you are, no masks, no makeup in the morning and even if sometimes you scream like crazy (not me hahah) he still loves you. Which means that you learn to love yourself also, both the good and the bad parts, which every human has. I am not a relationship expert nor am I a certificated therapist but I’ve shared with you my point of view from what I’ve learned in hope that it can inspire you or motivated you in building a healthy relationship.